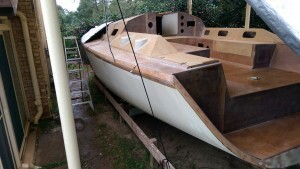 Our Didi 40 Cr Passion X sanded ready for painting. After a successful day sailing Passion last Wednesday when we scored a fine third place I was off to Perth to catch up with Dad and the family. I needed a break from sanding and did enjoy it. Our good result on Wednesday was a bit of a surprise as we knew izzi and Aggrovation had beaten us but when the results came they were the only ones to get through. Our third place just a few seconds in front of Larrikin increased our pointscore lead by another point. Monday I was back into the sanding and did very big day of alternate machine and hand sanding. I paid particular attention to the join between the cabin sides and top as this is the one we will see the most. A long board was used for the final fairing and I am pleased with the fairness of the line. I picked up today where I left off yesterday with more hand sanding and a final quick sand over all the deck with the random orbital sander with the vacuum cleaner attached. It was a perfect afternoon for painting with a warm light breeze and low humidity so I mixed up a 4 litre can and got stuck into it. The daylight ran out at the same time as the paint and I was happy to throw the disposable roller and brush out with everything painted except the transom. 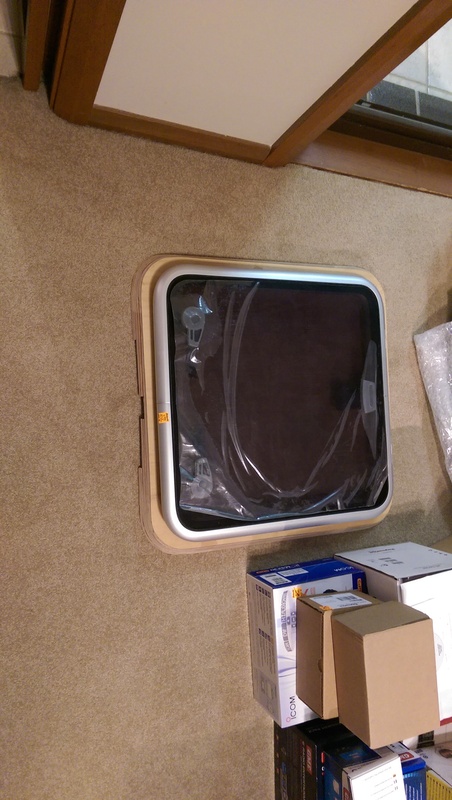 I took a short break from sanding on Monday to pick up the kitchen sinks and today the oven and refrigeration kit arrived. The after dinner treat was open the packaging and check out the new arrivals so the rumpus room is looking even more like a boat shop. Other after hours activity included ordering the shore power gear, the 240 volt circuits and the 22 litre hot water system. Right on schedule I have paid the big deposit on the rig and set a tentative delivery schedule for early November. 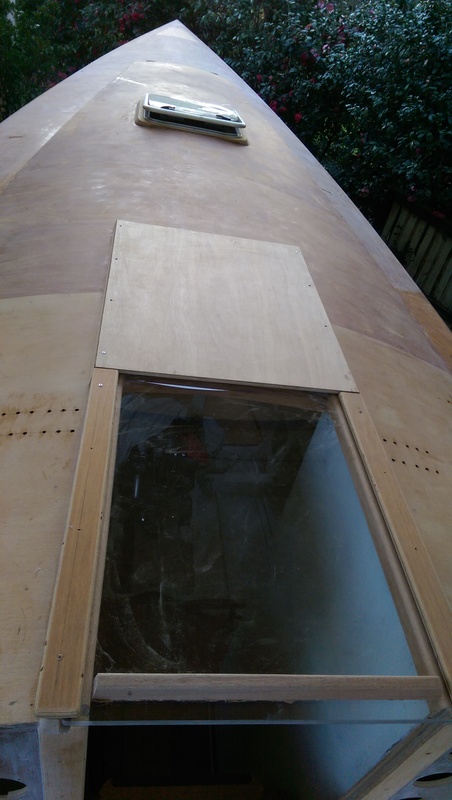 The garage has been a good refuge in the cold weather so I have taken the hatch covers there to finish the latch fitting, glassing and epoxy coating. I recycled the cut out from the top of the gas bottle locker to bond to the underside of the lid so that the lid locks in place. This takes the load off the hinges and hatch latch and also lets me glue in a slight curve in the lid. I am pleased with the latches as they are strong and the handles fold down out of the way. The anchor latch is the same as on the J122. The gas bottle and deck hatch latches have the same lift handle but are a rotary latch ideal for holding the lids down against a gasket. 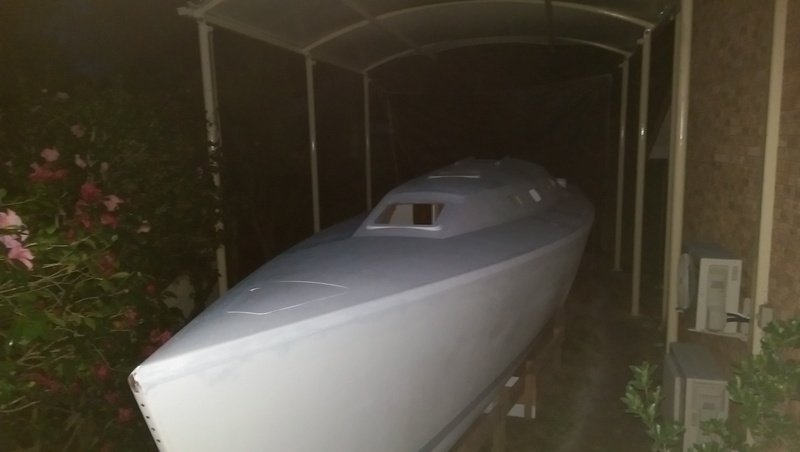 I am pleased with the glassing as tomorrow I can put the hatches back on the boat and keep the approaching wet weather out. 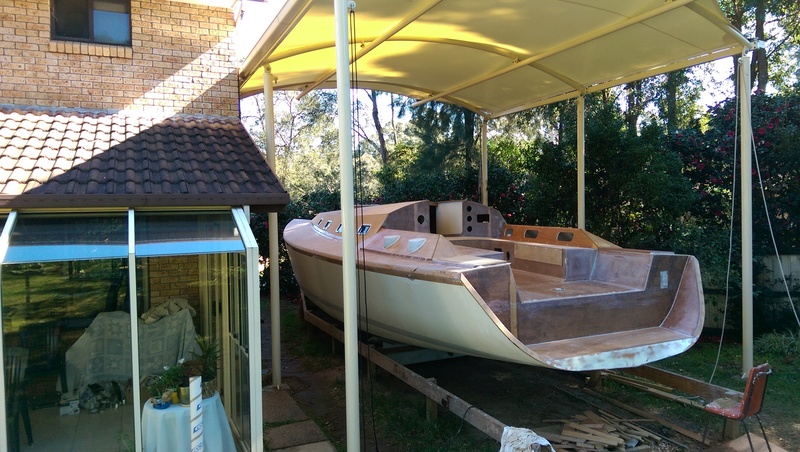 In the spells of sunshine I have pushed on with sanding the epoxy coating on the deck taking turns to use the random orbital sander and do hand sanding in the corners or on edges. 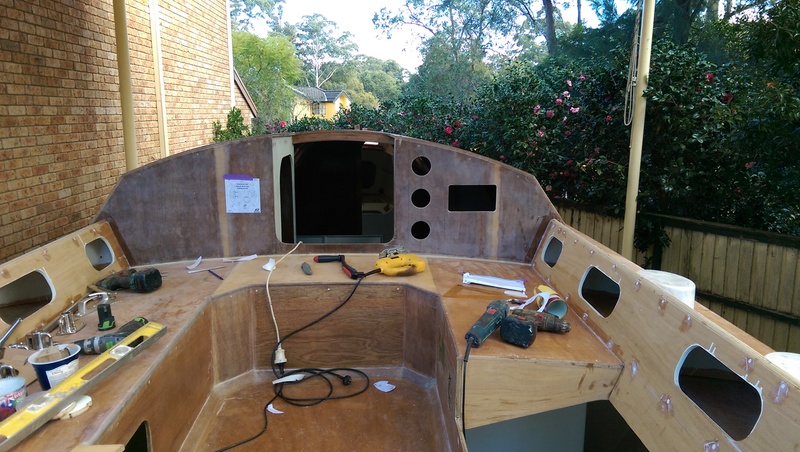 I have finished sanding the cockpit and transom and have about half of the deck to complete. 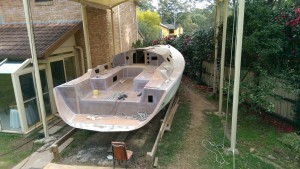 I am looking forward to the first coat of white primer on the deck next week. 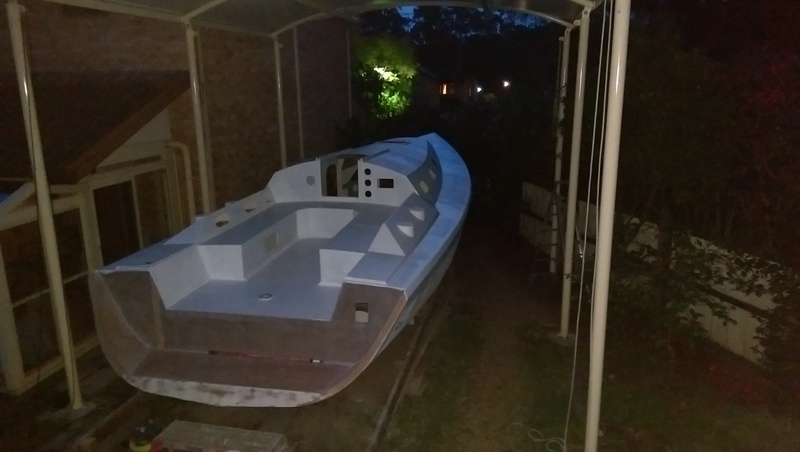 Again in anticipation of a few days of rain I gave priority to sanding any bare timber and epoxy saturating that so as of tonight there is no bare plywood edges or timber exposed to the wet and all the fitting cut outs and fastening holes have at least one coat of epoxy on the plywood edges. I even saturated the bolt holes for the stem fitting with epoxy using a long thin brush and a lot of patience. That went better than expected and the surplus epoxy was still dribbling out hours later. The photo shows the hatched lined up in the garage with latch holes drilled and epoxy or epoxy glass coating depending on the hatch. 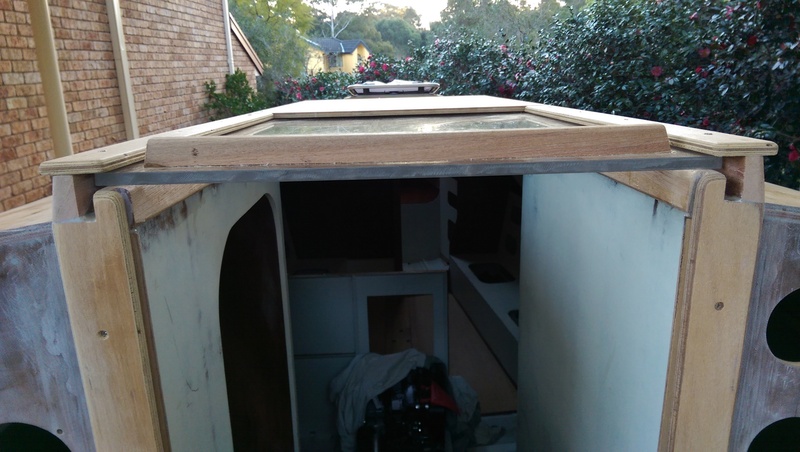 The garage for the companionway hatch is the last of the external wood work before the deck is painted. After painting I will fasten pre painted toe rails to the deck. All the holes for the fittings that are drilled have been filled with epoxy twice to seal the end grain of the plywood in the holes. It helps to have willing crew to clean up the underside of the deck and fix masking tape over the holes so we can dab epoxy into them without dribbling it into the cabin. The glass on the deck has been faired into the sides of the hull ready for the paint to go over the gunwhales and be blended in with the paint on the topsides. Again it helps to have crew who remove all the packaging tape from the edge. While sanding the gunwhale edge I have sanded a the top third of the topsides which had a few epoxy runs from the deck work and now it is looking clean again. The weather could be turning wet again but I have accumulated a lot of internal jobs. Our windward work on Wednesday at the RANSA Winter series was about as good as it gets. 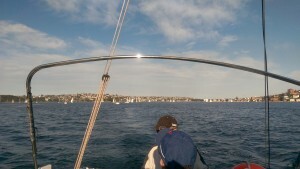 We won the start at the pin which was the windward end and carried on as yacht tacked behind us. We were hoping to benefit from a right hand shift and were not the only ones thinking of that. The first movement favoured those who had tacked behind us and we gave up about three boat lengths on Aggrovation when we crossed again. Allegro looked good coming across from the northern shore but on the next move they carried on to the extreme south side of the course while we took their place on the north. This was a big win for us with a ten boat lengths gain on Aggrovation and a much larger catch up on Allegro. Our three nearest rivals on pointscore were close at hand with the biggest danger, Larrikin tucked away behind. The run back from the heads was a bit nerve racking as Aggrovation was right on our tail. 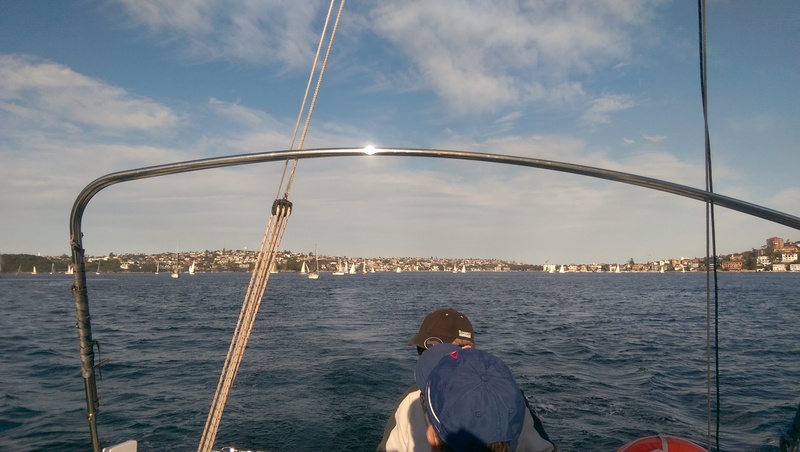 They were still there around the turn mark in Rose Bay but on the run to Point Piper we all lost the breeze and the gaps widened out. Trim passed us here and on the beat to the finish line cleared out as they should. The lighter airs at the finish of the race spread the fleet out with the faster early finishers benefiting from the slow beat home of the rest. We were lucky to hold onto third place and even luckier that Aggrovation and Larrikin took longer to finish that they deserved. We finished well in front of the three Northshore 38s which are our benchmarks. We are currently giving them time and I suspect we will be giving them much more in the next race. The RANSA fleet still finishing in the dying breeze. Where plywood doublers are required under fittings I have been using temporary screws through the holes for the fittings to clamp the reinforcing to the underside of the deck. I have to be careful that the glue does not cure too much before taking out the temporary screws otherwise the screws will break. During the week I took gamble and left the screw extraction until the morning. I took to the task as soon as I woke and was lucky to get the screws out intact. I am not game to take the chance again and will wait up until the glue is just right tonight. I still have about ten backing pieces to install including ones for fittings that I have yet to purchase. I need to get this job finished so that I can paint under the deck but it is a fiddly job and there is not much to show for the effort. 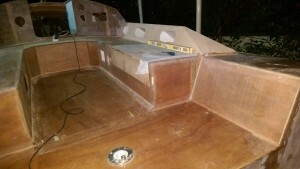 The jobs that give most for the effort are attracting me so I have almost finished the companionway hatch. This seemed like a simple job but I wanted it to look classy so I have spent quite a bit of time getting the alignment just right and using spacers to keep everything parallel. I have put a taper on the runners and given the hatch garage side skirts for a bit of class. To ensure a good fit I used 1.6 mm veneer as spacers between skirt and runners and screwed the assembly to the runners while the glue cured. Plenty of kitchen paper made sure that the garage would not stick to the runners. The skirts will be glassed to the garage roof inside and out to make it sturdy. 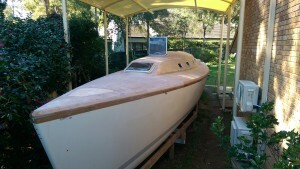 I had thought of leaving the garage off as on my Jeanneau SO37 buy the garage is a neat way to keep the water out. What I have settled for is the same detail as on the Jeanneau SO37 but with the garage in front section. Behind the garage capping pieces keep the sliding lid in place and provide hand holds as on our SO37. 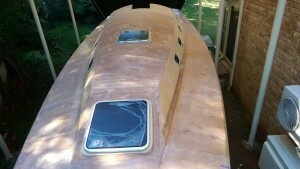 These will be painted as I am tired of the continual varnishing required on the hatch trim on the production yacht. Last Friday the crew helped with marking out fitting positions so we were able to drill all the holes for the Ronstan genoa tracks, the Spinlock rope jammers and deck organizers and the Harken winches on the cabin top. The fittings I still have to acquire are the cheek blocks for the genoa sheets and the jammers for the spinnaker kickers. That should leave just six pad eyes for the cabin top life lines, the spinnaker pole down and the baby stay. The paperwork for the launch is progressing and during the week I obtained my MMSI number for Passion X so that the new VHF radio and AIS system are registered. I still need to get an EPIRB and have it registered before our first offshore venture but I am getting a bit ahead of myself. Thursday should be another milestone if the new build passes Survey for insurance purposes. It might not be finished enough but it is a very good stage for an inspection before I cover all the structural detail with paint. 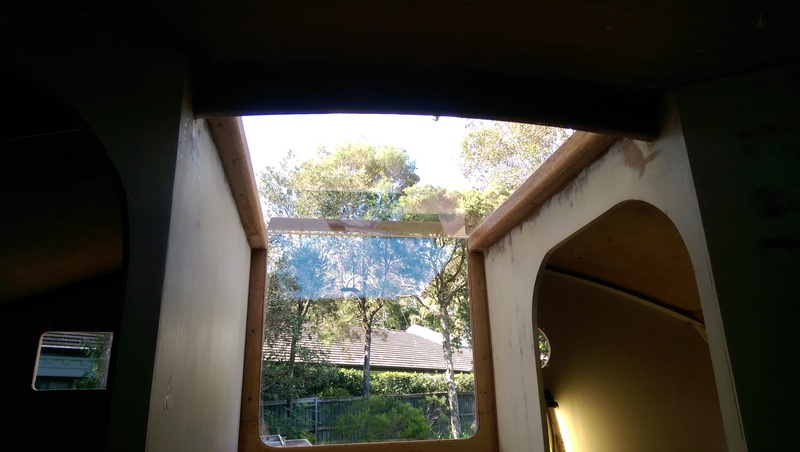 External view of the companionway hatch before making the hatch garage. We had a very good race on Wednesday, possibly as good as it gets with a reach up to the heads and back and only a short work to the finish. Even that was not too tight so it suited Passion very well. Only Fidelis enjoyed the reaching conditions more than Passion and she zipped around the course for a 12 second handicap win. Aggrovation gave us plenty to think about on the course and we were never more than a couple of boat lengths apart so they had a well deserved third. I thought Larrikin had blow it with a mark infringement however we were all so far up the fleet that they still finished seventh. By my calculations we pulled a further five point away from Larrikin and seven from Allegro. That gives us a 16.5 point buffer with two sixth place drops in hand. Now I was waiting for the official point scores to be posted on the RANSA web site but they are still unavailable. What was surprising about the race was our performance compared to the Northshore 38′s. I would have expected them to revel in the reaching conditions but we had one of our best wins against them. We did give it all with the carbon No 1 genoa and a full main and we did work the backstay aggressively through the wind range. We did get a very good start and did keep clear air all day. Now we need to do it one more time to seal the series. 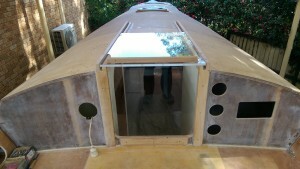 I have taken a gamble with the weather conditions and made progress on the exterior of our Didi 40 Cr. 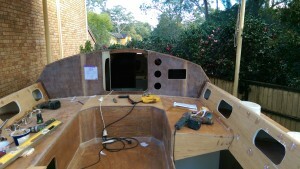 The raised sitting area behind the coamings at the transom has been completed to match the gas locker lid appearance. The transom has had a light layer of epoxy glass applied and the coamings have been saturated with epoxy. While the glass on the transom was curing I started shaping the surrounds for the hatches on the coachroof. Dudley suggested gluing the plywood to the deck and planing the ply flat to match the hatch. 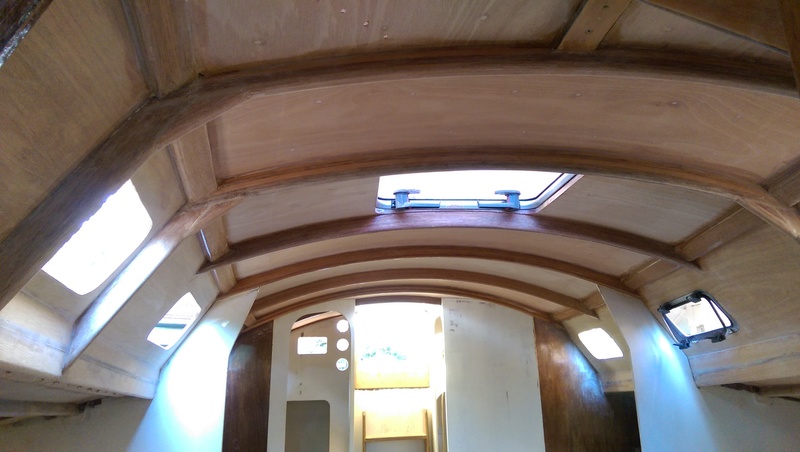 I preferred to make up the surrounds on the workshop floor where I could keep the inside edges of the ply layers vertical and then shape the underside of the cured assembly to match the curve of the deck. 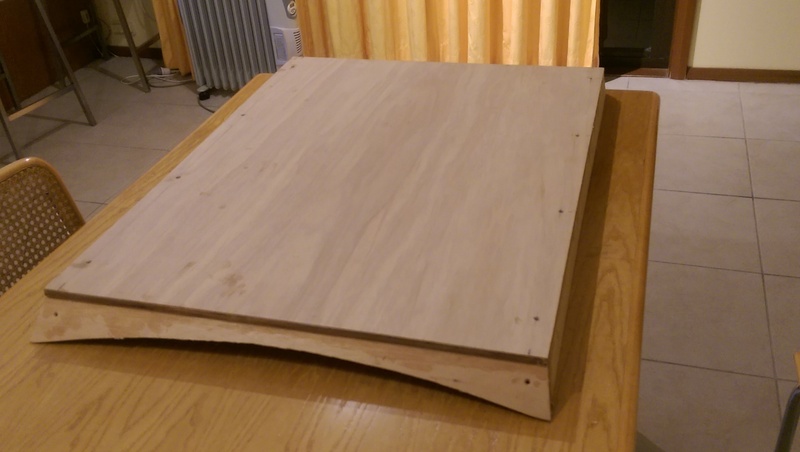 I needed quite a few trial fits to get the curve matching the deck but the layers of plywood provide very good guides for keeping the underside consistent. In the workshop I found it easier to shape the edges of the assembly than it would be once attached to the deck. The rain did arrive just as I was cleaning up the excess thickened epoxy from around the joins but I did enough for a neat job. It was sunny this morning and good conditions for finishing the clean up of the hatch surrounds and taking a few photos. Everything seems to fit well. Elaine gave her seal of approval and helped me put all the hatches and portlights away until the painting is finished. 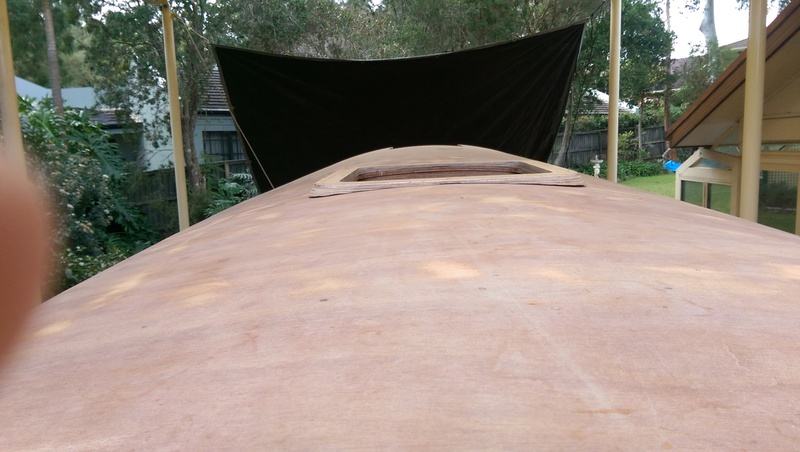 The rest if the day was consumed with the companionway hatch surrounds. I wanted a bevel on the edge of the hatch edge runners so that meant a thicker piece of timber and some tricky angles to saw and plane. That and making up spacers to keep the runners parallel took up most of the afternoon and I never got around to cutting up the toe rails. Good new is the edge runners are glued and screwed to the cabin top and tomorrow I will be able to remove the spacers and install the bottom runners for the hatch. On the outside of the hull that will leave just the toe rails to cut and install and it would be nice to have someone hold the toe rails while they are bent into position. 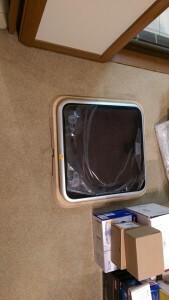 Trial fit of the first cabin top hatch surround on our Didi 40 Cr showing the sloping edges. The house is in the way of a good shot of the port side and portlights. After a first and second place the previous weeks coming in sixth seemed like a bit of a let down. Two seconds faster and it would have been a fifth place in a depleted fleet of just eight yachts. Yes the forecast was so miserable that it kept all but the most hardy of sailors ashore. Aggrovation returned to the fleet and had a handy win. They chose their sails for the day well and deserved their first place. Rainbow set a large genoa and a reefed main and did well to come second after a first the previous week. Hopefully the handicapper is noticing. Allegro set the most sail area in the fleet and went well on the run to the heads but must have suffered on the return to record a fourth place. Both Izzi and Passion were caught on the outside of a big left shift that gave the inshore boats a big gain. Fortunately for us the wind was light close into the headland so we made up some of the ground. The reef we put in on the work back reduced our sail area too much for the variable conditions. Against the forecast the afternoon was the lightest period in the 24 hours and our rig was perfect for the wind at 7 pm. when we were home in the comfort of the air conditioning. I think the sixth place was a good result considering we were under canvassed for a good part of the race and the big left hand shift that helped everyone except Izzi and us. It was appropriate that it was Izzi that beat us by the one second as we sailed the same course and they had the better rig for the conditions. Our sixth place is a drop. We have two sixth places as drops and an 11.5 points lead in the pointscore. We can use the two drops and still be in front 1.5 points even if the next yacht has two wins. Wet miserable days suit us when the fleet is depleted. Our worst scenario is lovely weather from here to the end of the series that brings the whole fleet out to play. These pictures of the gas locker lid show it raised 24 mm from the deck and also how the coamings fair into the locker lid. I have a matching raised section on the starboard side. The gap from the transom to the lid is to leave clearance so the lid clears the pushpit supports. 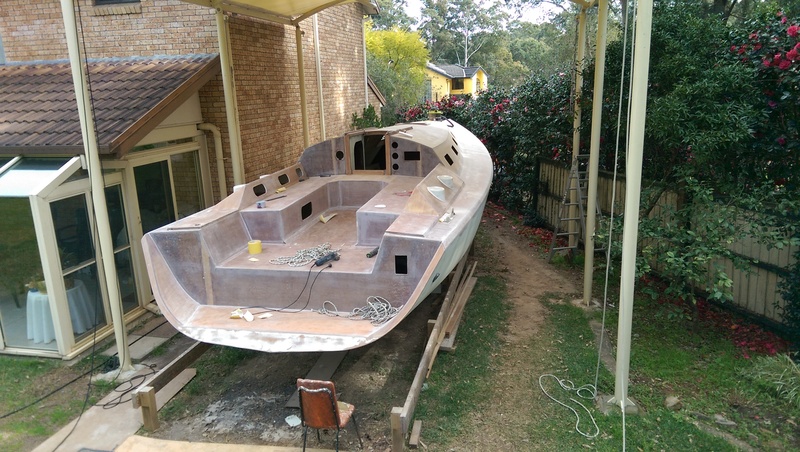 While the boat trimmer was measuring up for bunk mattresses and settee seats I was busy measuring up doublers for under the deck where holes have already been drilled for fittings. 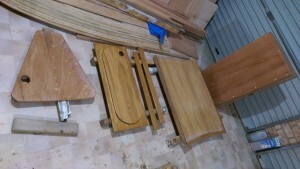 The ten backing pieces have been located from the dwindling pile of plywood offcuts and have been sawn roughly to size. That is tomorrow’s job. 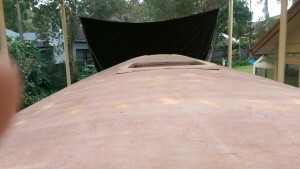 Quarter view of the gas locker lid showing how it is raised 24 mm from the deck and how it blends in with the coamings. I made the sloping rear of the coamings finish at 24 mm to match the locker lid. 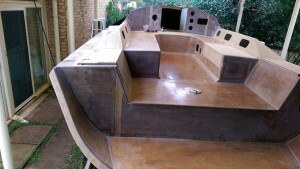 I have more or less finished the lid to the huge locker on our wide stern version of the Didi 40 Cr. I have followed Dudley Dix’s details as closely as possible given the variation to the deck plan. In the case of the locker the lid is a few millimeters shorter due to the extra reinforcement placed around the frame at the point the cockpit widens out. The frame is 9 mm ply and to which a double has been added extending back below the deck so that the deck is bonded to the 18 mm thick section of the frame. Because I did not want just an 18 mm thick edge to the end of the locker I added two 12 mm packers before the start of the water trap. The timber of the water trap is 19 mm thick and then there is another 12 mm ply inner edge to the water trap. If you add all this up there is a cross section 83 mm thick and 40 mm deep at the aft end of the locker. That will be a good strong point to harness attachment loops. Under the lid I increased the depth of the stringer from 35 mm to 44 mm so that the lid would not deflect during the bending of the ply around the slight curve of the cockpit seat and for support once completed. The lid looked so good when I cleaned up the edges this morning that I felt compelled to add the hinges and check the clearances. A little bit of timber had to be sanded off the back edge of the 12 mm ply water trap to clear the rear cleat on the lid. Once that was done it worked just like a bought one. That inspired me to complete the gas bottle locker lid which is out in the cold and dark waiting for the fast cure epoxy resin to do its job. 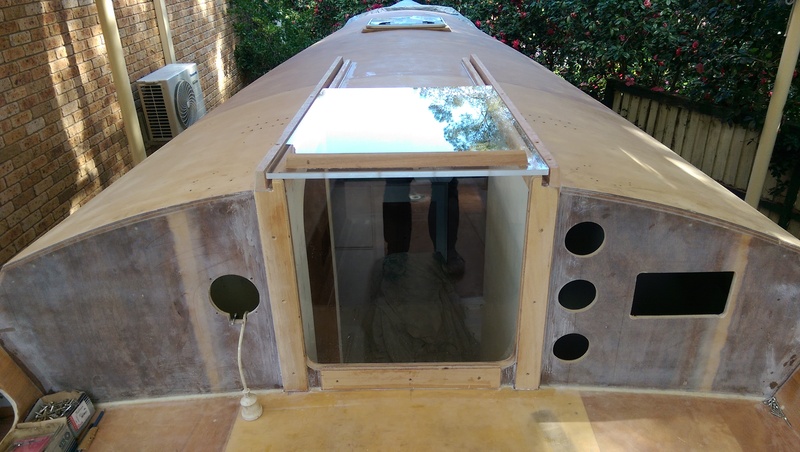 The gas bottle locker lid has been raised 24 mm above the side deck so that water washing past the coamings has to go all the way to the transom and in most conditions the person sitting on the wide deck will have a dry bottom. 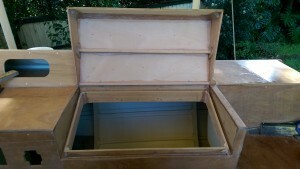 There is a broad 12 mm deep lip around the top of the locker that the 12 mm ply lid will sit on. I will form a flexible gasket in situ to make sure the lid is gas tight. 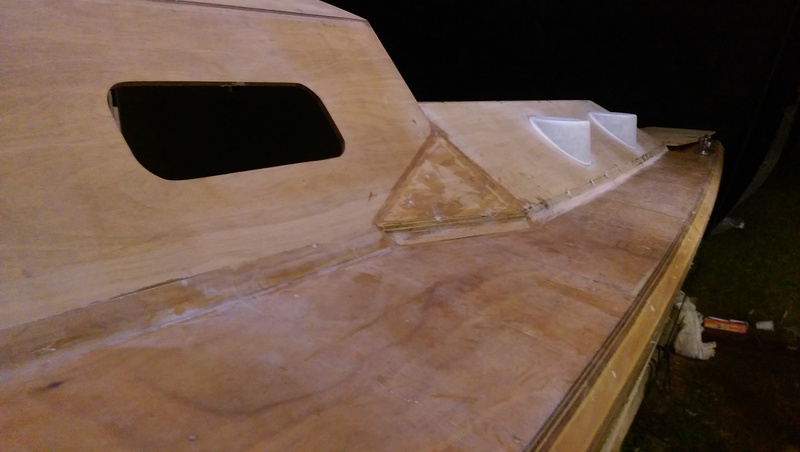 The edge of the lid back has been trimmed to the same slope as the coamings so that there is a continuous line from the start of the coamings to the transom and a neat finish to the end of the coamings. On the other side there will be a dummy lid to keep the seat above the side deck by the same 24 mm. If it is wet tomorrow I will try to finish the doublers under all the deck fittings and if it is dry and sunny I will do the external glassing on the cockpit coamings. I cannot make too much of a mess as I have someone coming to measure up the bunk and seat upholstery. This morning I registered Passion X with the NSW Roads and Maritime Services. I must say the staff at Services NSW were most helpful and the task was quite painless. The only disappointment is that they registered it as “unknown manufacturer” as there is not a category for owner builder. The registration number is AIV947N. The hinged locker lid almost ready for glassing. Note the thickness of the aft edge of the locker. 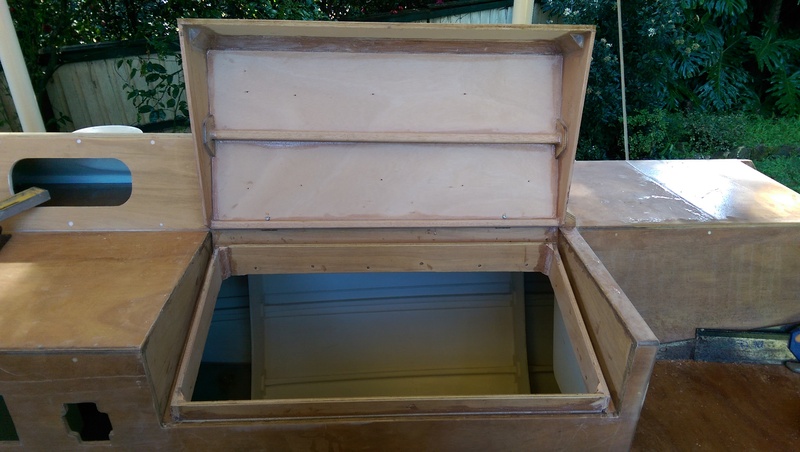 About 30 pieces of timber were used to make the water trap and locker lid. Lots of jobs part finished. The coamings are glued and screwed in place and today I finished the fairing pieces where the coamings return to the cabin sides. Lots of tricky angles to get right but the final appearance justifies the work. The locker lid is part finished in that it is glued up in situ waiting for the glue. To get the curve in the top of the locker lid to match the seats I had to use two layers of 6 mm plywood. When the glue cures the curve should be locked in place. 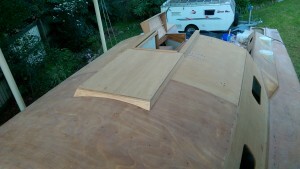 cabin top hatch surrounds. These are made of plywood and shaped to go from the curved cabin top to the flat of the hatch. 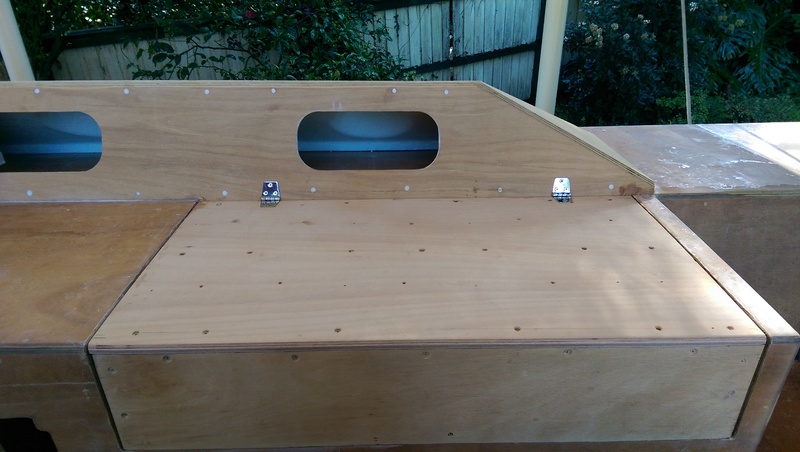 The glue in the cockpit locker lid is curing while the lid is secured in situ.